Beginners Welcome! Students may join at any time. Yoga is one of the world's most ancient and refined systems developed for the improvement of physical and mental health. Body, breath and mind must take an active part in the practice to create a deep integrated effect on the whole psycho-physical structure. Proper breathing and breath awareness exercises help one to become conscious of the process of breathing and to utilize and improve the capacity of the lungs. Physical and mental relaxation is just as important as exercise. Deep yogic relaxation has a rejuvenation effect. When one is not disturbed by tension, emotions and sense impulses, the healing power of the body itself can work incredible improvements on one's health. 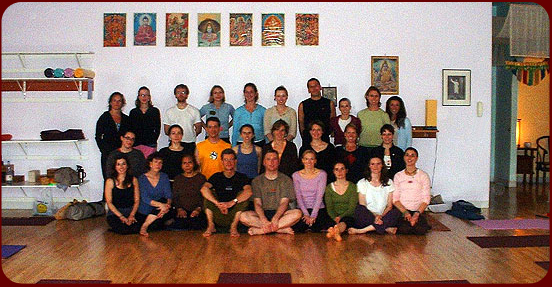 The Chicago Yoga Center is committed to present a variety of the main Yoga traditions. We have been offering classes since 1984. What typifies the Chicago Yoga Center's approach is the integration of the classical Hatha tradition, with branches of Vinyasa, Yin, and K. Pattabhi Jois' Ashtanga Yoga. We respect each of their potential to promote the "union" of the body, mind and the innermost self. Our students have the advantage of experiencing these different styles, from a delightful Restorative, to a centering Hatha class or a flowing Vinyasa session to the most dynamic and challenging Ashtanga practice. We also encourage our students to attend classes with different instructors to select a class of their own choice and level. "In the living body, breath is like the fly-wheel of an engine. And the nerve-currents, the thoughts, the desires and mind are like the finer parts of the machinery. When the fly-wheel moves, the whole machinery with all its delicate mechanism moves. When the fly wheel stops, the whole machinery stops. Likewise is the connection between the breathing and the other subtle bodily functions. The most obvious manifestation of the Prana in the body is the motion of the lungs. If this function stops, the the other motions in the body stop." Swami Narayanananda (1902-1988) is the author of 36 authoritative books on Yoga and spiritual psychology.